The battery storage for solar panels is very important to the overall home PV system. There a few reasons for that, but the main one is cost. 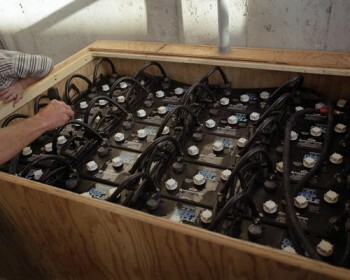 The batteries can be one of the most expensive components of your entire home solar power system! So you want to pay close attention when building the battery bank. To help you in the construction process, here are 3 tips you can use. 1) Stay away from automotive battery. When you are building a battery storage bank for your PV system, do not use car battery! If you use them, you will be wasting your money. Automotive batteries are not designed for residential solar power system because they are not made for the deep cycle usage that occurs in PV systems. Car batteries are used for short time interval when you need a large power surge, for example, the high voltage needed to start an engine. It is then immediately recharged by the vehicle electric alternator. It does not need to be discharged over a long period like batteries that are tied to a PV system. Solar system needs battery to discharge small amount of power over a long period of them. The battery will then to be charged on an irregular basis because we can’t be sure if there’s a clear sunny day to charge the Photovoltaic cells. An automotive battery under these conditions will die after only a couple of discharge and charging cycle. 2) Have more than you need. The recommended energy discharge for a home solar system battery bank is about 50 percent. So when you have calculated the power requirement needed for the PV system, multiplied it by a factor of 2. Next, build the battery bank based on that figure. You don’t want the batteries to discharge all its power just to keep up with your home power needs, therefore, have more battery units. 3) The lower rate of discharge the better. If the batteries are properly sized and maintained, the life span for a PV system battery can be anywhere from 3 years to 10 years or longer. However, the life span will depend on how much you discharge the battery. For example, if you have a battery that is being discharged at 30 percent of its discharge capacity versus another battery that is discharged at 80 percent, the battery with a higher discharge rate will die much sooner compared the one with lower discharge rate. To solve this issue, again, it is best to have a larger battery bank than required by your PV system. Do you want to build your own home solar power system and start reducing your monthly electricity bill? If you do, you will need a DIY residential PV system guide. For an easy to follow home renewable energy guide, check out the Earth 4 Energy program from Michael Harvey. The program comes with a step by step guide to building a homemade solar panel and 7 High Definition (HD) instructional videos. For more information, read the Earth 4 Energy review post on this blog. It has taken more than a decade for researchers to develop a new generation cost effective deep storage battery which is not only small but safe too and can be fitted easily in the basement and can power your home. It is the most important breakthrough and can be widely used for residential solar power electricity. Though solar energy has been there for some time but the exorbitant cost in the installation has been the main factor which is the big deterrent. More home owners would have setup their own home solar power system if the cost was affordable. But with the latest development in solar technology and the installation cost have come down considerably, the use of Photovoltaic (PV) thin film chemistry in the manufacturing has brought down the cost drastically. Some companies are even offering $2 a watt which was $8 just few years back! The use PV thin film and PV panels have encouraged people to shift to alternate energy thus the dependence on fossil fuels have come down to some extent. Another breakthrough is the high levels of energy storage which can now be achieved safely. In the past, it would take a large number of deep cycle batteries to make up a battery bank capable of supply sufficient energy for a household. When you have too many batteries in the basement, the first thing you have to consider is the safety issue because this type of battery does give out dangerous hydrogen gas when in charge. Secondly, you have to consider the maintenance effort you would have to put in to make sure the battery bank runs properly. It’s fair to say, if you don’t have the time to look after a pet, most probably you won’t have the time to look after solar battery storage bank.